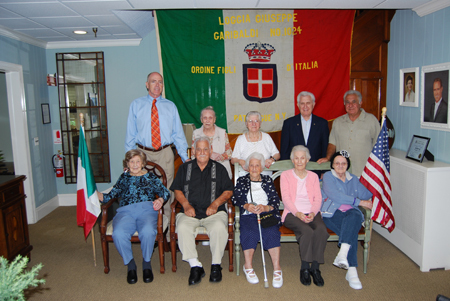 Back row (left to right): James McPeak, Owner, McPeak's Assisted Living and Chairman of Patchogue Foundation Cultural Heritage Committee; Mildred Verderosa and Antonia Levato, Residents, McPeak's Assisted Living; Lenny Locantore, Chairman, St. Liberata Italian Festival; and Jim Romeo, St. Liberata's Italian-American of the Year. Front row (left to right): Ellen McCormack, Tom Dioguardo, Lucy Dioguardo-Swan, Anna Wanamaker, and Evelyn Grasso, Residents, McPeak's Assisted Living. Residents at McPeak's Assisted Living gathered together to celebrate their Italian heritage in honor of the upcoming Patchogue Italian Festival of St. Liberata, which will take place on September 27th. The festival will feature a day of Italian music and food, and celebrate Italian culture. Some of the McPeak's residents attended the original St. Liberata Italian Festival, which began in 1923. The event is a precursor to the Feast of San Gennaro, which was first held in New York City in 1926 — three years after the Italian Festival of St. Liberata.